Grab your bike and enjoy the thrill of exploring NSW national parks on a cycling adventure, with mountain biking trails for all levels. Take a historic ride along the convict-built Old Great North Road in Dharug National Park near Sydney. Cycle through pristine bushland in the Blue Mountains and stop by scenic lookouts on the Bundanoon cycling trail. Kosciuszko National Park is a mountain biking mecca, and Thredbo Valley Track is one its most popular two-wheel adventures. Experienced riders can take the challenge of the purpose-built Gahnia and Serrata trails in Sydney's north. Jump on your mountain bike or walk Thredbo Valley track in the Snowy Mountains, as it follows the river from Thredbo Alpine Village to historic Bullocks Hut. Enjoy mountain biking or a day walk with fantastic gorge views along Burramoko Ridge (Hanging Rock) trails, in the Grose Wilderness of Blue Mountains National Park, near Blackheath. Grab your mountain bike and hit the Loftus loop trail in Sydney's Royal National Park. This 10km mountain bike ride is sure to get your heart pumping. Spend the day riding your mountain bike on the trails in Glenrock State Conservation Area near Newcastle. There are rides to suit all levels, and even the kids can ride. This popular 7km horse riding, mountain bike and walking trail in Ku-ring-gai National Park in Sydney’s Terrey Hills area takes you past several beautiful lookouts and picnic spots. Cycle through lush subtropical rainforest and eucalypt forest. See spectacular waterfalls and enjoy beautiful picnic and swimming spots, close to Coffs Harbour. Jump on your bike and explore Gahnia and Serrata mountain bike trails in Garigal National Park, a short drive from Sydney’s CBD. The purpose built trails are the perfect place to challenge yourself. 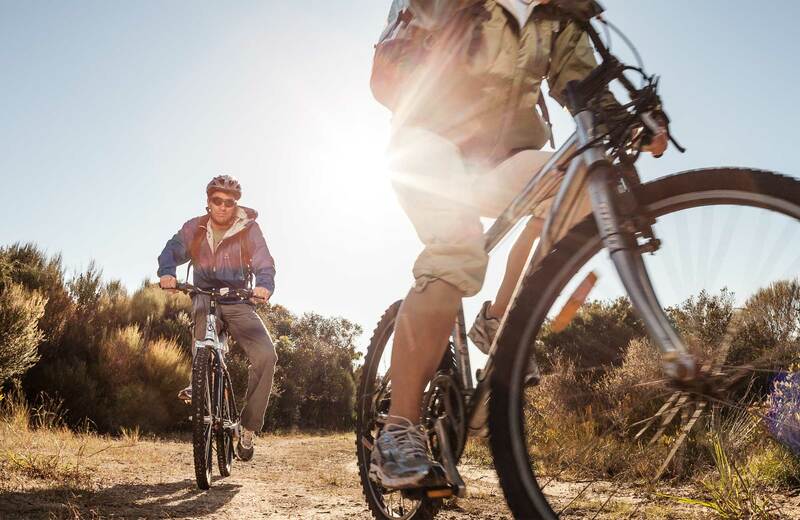 Five Mile mountain bike trail offers 7km of purpose-built mountain bike trails in Murray Valley Regional Park, near Echuca and Moama. The trails are suitable for all skill levels and it's one of the best places for biking in the region.